Since a couple of years ago, global attention has shifted drastically to investing in digital assets. The good news is the avalanche of platforms where individuals can buy and sell digital assets with relative ease. Although the available options promised to be the best platform for making digital asset transactions, they have failed to live up to their billings. That necessitated the need for an exchange company that can walk the talk: Coinsquare. Coinsquare was created in 2014 to address the needs in the cryptocurrency world. Since its establishment as a reliable exchange, it has followed its mission “to revolutionize and simplify the buying and selling of digital assets.” Over the years, the company has stayed true to its promise by delivering top-notch services to its users. It doesn’t achieve that through the stroke of luck. The company worked hard to carve a niche for itself by making provision for its users. This involves creating different plans with different features that are designed to meet the specific needs of the users. Regardless of your years of experience in the digital currency world, Coinsquare has made its platform suitable for your needs. Quick Trade is primarily designed to give newbies the opportunity to conduct transactions with ease. •	Availability on Android/iOS devices to make trading on the go easier for the users. •	Access to valuable live quote. •	An affordable fee of 0.2%-0.4%. 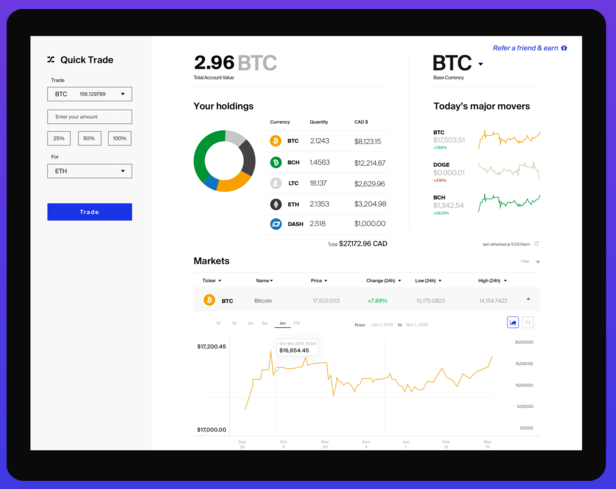 Specifically designed for traders who have been in the business for years and conduct large volume trades, this trading method cares for the needs of traders who can trade with as low as $25,000. •	Preset pairing selections for setting limit orders. •	Low fees between 0.1% and 0.2%. This trading platform offers you the opportunity to earn passive income while conducting transactions. You stand a good chance to earn as much as 45% commission for each referral you make to the company. Whenever your referrals conduct transactions, you will receive your BTC commission. That’s a great way to earn passively for as long as you want. If you have experienced difficult trading processes on other platforms, you will be spared of such experience on Coinsquare. As depicted in the image below, the transaction process is easy and smooth. To make transactions easier, you also have all the information about your transactions in addition to other valuable pieces of information. Coinsquare claims to the most secure trading platform. Well, that claim shouldn’t be taken with a pinch of salt because the platform’s proprietary system ranks high among trading platforms that have been fully tested to ascertain how it can handle stress and DDoS. It is reassuring that it aced the test, making this platform a very secure option for those who are worried about security issues. Speed of transaction is one of the major factors that are considered when choosing a trading platform. The availability of a wide range of trading methods ensure that you can get faster transactions done by using the right method that guarantees better trades than using a random method that may pose unwanted issues. This great trading platform offers you these benefits and more. However, before you can take advantage of the awesome offers to make trading easier for you, you must first sign up on the platform. 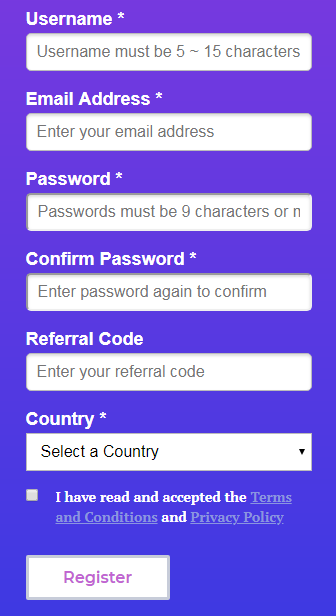 The sign-up process is simple and straightforward. You are only required to provide the right information in the form and you are good to go. In spite of the huge collection of digital asset trading platform available across the globe, the distinct features of this trading platform make it stand out among its peers, making it a go-to platform for cryptocurrency traders who want nothing but the best service, but now and in the future.